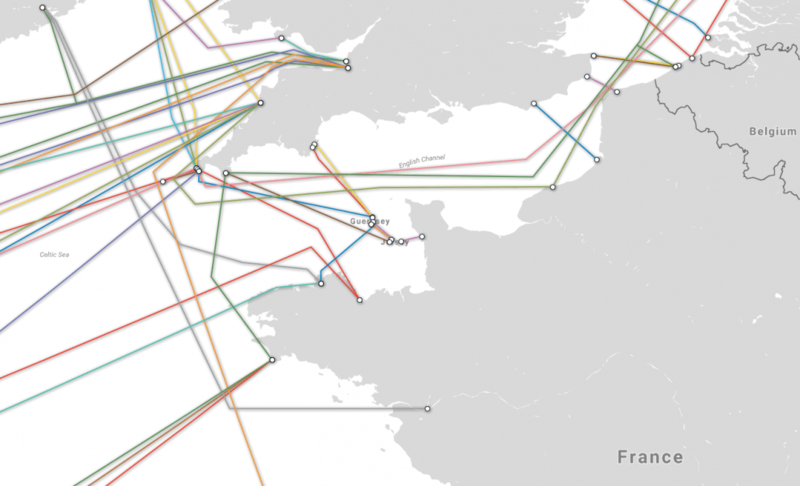 I’m mostly writing about the fact that the Isle of Jersey lost most of its Internet connection after its three main submarine telecommunications cables were severed by the anchor of a liquified petroleum tanker named the King Arthur so I can use that headline. Internet speeds on the UK island of Jersey have been slashed – literally – after a ship’s anchor destroyed three submarine cables linking the isle to the British mainland. But longtime readers of this site know that I obsess over severed cables, even if the cause is so readily apparent. Plus, when things like this happen, it tends to get noticed. When the Northern Mariana Islands lost its one Internet cable in 2015 in a big storm, the FCC all of a sudden decided underseas cables were something it did and should have regulation authority over, passing a rule the telecoms were none too happy over. And while Jersey will be back to full capacity a lot sooner than the three weeks it took to get the Marianas back online, given its role in global finance, Jersey is a tad more sensitive than the Marianas. So keep an eye on the aftermath on this unlikely assault an Italian ship named King Arthur made on one of the UK’s key tax havens. Maybe it’s really Spanish, not Italian; it might then be the famous “lost ship” from the Spanish Armada, finally showing up to fight Merry Olde England. Hell of a time warp, though—428 years. Like the one in the movie “The Final Countdown”. From the NYT review: “What’s going on, briefly, is that on Dec. 7, 1980, the United States Navy aircraft carrier Nimitz, while cruising off Pearl Harbor, passes through some sort of time warp and finds herself cruising off Pearl Harbor on Dec. 6, 1941. When the Nimitz’s commanding officer, played by Kirk Douglas, realizes what has happened, he must decide whether the Nimitz should sink the Japanese fleet and thus rewrite history, or allow history to take the course we know it did.” It’s a gas; watch it some night when you just want to veg out. That’s assuming your “cable” is not broken. Funny how a single incident could sever all three cables, and involve dropping and dragging an anchor in a well-posted restricted area. I wonder if even stereotypical jokes about Italian efficiency cover the implausibility. The navy of every serious anti-money laundering country in the world must be lining up to do the repair work. If I were a serious money laundering country I’d have my own navy available to “repair” the cables to my specifications. What do you think? Wouldn’t that be a great place to build a sleeper cell? A few fellas in undersea cable repair, a few in electricity transmission tower repair, a few in municipal water supply repair, etc., etc., each eventually able to plant some time bombs or Sarin canisters in the appropriate places, activate 5 or 10 or 20 years later? Neat! As it turns out King Arthur was mostly a myth the English had to invent for their own self-image. Adding … if everything has to go through that one cable to France rather than those 3 bigger cables from London, it would make it a hell of a lot easier to wiretap anything they wanted. Maybe there’ll be a Jersey Leaks in a little while. Welsh-Celtic- not English. Arthur fought the English. Isn’t that enough for you? Anyone know what Chris Christie’s been up to lately?